“The plaintive notes of a copper born, followed by the joyous music of a pack of hounds in full cry across frost-filled fields, have echoed over Columbia County hillsides for years in the time-honored sport of foxhunting”. Smith of Canaan, established the Lebanon Valley Hunt. Captain Smith, a former U.S. Army Cavalry officer, had gained hunting experience abroad. When he approached W. Gordon Cox of New Lebanon on the subject, Cox asked, “Is that the kind of foxhunting where people dress up in scarlet coats and ride over the countryside”? “Yes,” Smith replied, “it was indeed the same sport.” Gordon Cox not only became a hunt member, he also became a founding member of The Old Chatham Hunt. In the summer of 1927, Smith and Cox organized paper chases (pieces of paper laid down as a course to follow) which proved popular In 1928, five couple of hounds were drafted from the Goldens Bridge Hunt. On their introduction to the foxhunting, membership grew. Polo was introduced to Lebanon Valley in the summer of 1928 and Sunday matches drew large and enthusiastic gatherings. In 1929, the Lebanon Valley Hunt was registered with the Masters of Foxhounds Association (MFHA) and meets were held in eastern Columbia County and western Massachusetts. Captain Smith became the first Master of Foxhounds (MFH). Allen F. Arnol and George Gilden of New York City, both of whom had ridden with the Berkshire Hunt in Lenox, Massachusetts, were the first whippers-in along with Gordon Cox. The George Tilden residence in New Lebanon became the hunt’s club house; stables and kennels were readied for future years of hunting. When commercial ventures invaded the Lebanon Valley, however, it was decided to seek new country. In 1930, Smith, Cox, and Blanchard Rand, a prominent rider and polo player from Salisbury, Connecticut, were invited by Wilson Powell of Old Chatham to look over the Squire Hammond proprty in Old Chatham. The property proved ideal. The Hammond House on what is now known as Hunt Club Road was remodeled, a 40-stall hunting stable was constructed, and locker rooms were provided for a professional staff. The latter included huntsman Thomas Thornton who had served in a similar capacity for General George S. Patton. 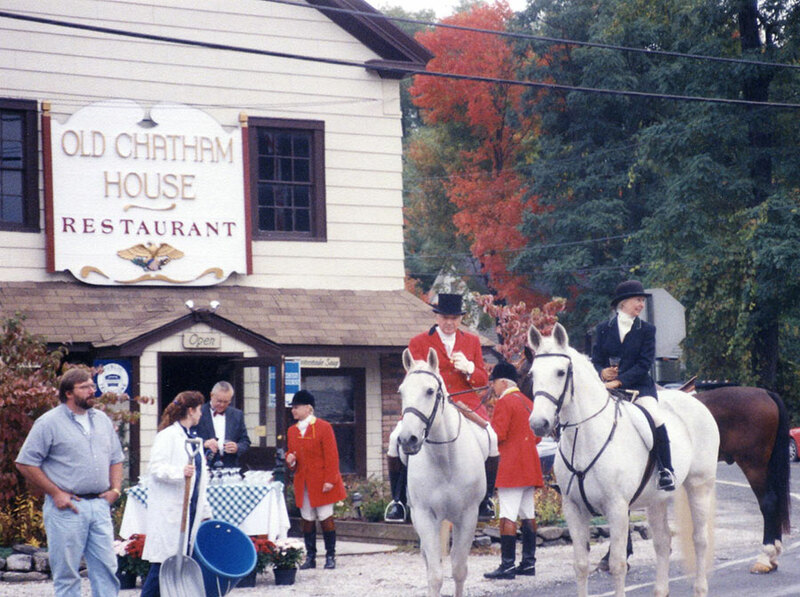 When the hunt moved to Old Chatham, it became The Old Chatham Hunt. Some of the nation’s most prominent families-including the Roosevelts of Hyde Park, the Saltonstalls of Boston and the Astors of Long Island-rode with the Old Chatham Hunt. One season, the Saltonstalls even rented a home in New Concord just to be near the Hunt. Foxes were plentiful, fields were open and long runs were possible with not a single major highway to cross. With the approach of World War II, Chester A. Braman of Old Chatham became MFH. But many of the young men and women who had ridden with the hunt entered the armed services. Then came gasoline and meat rationing that made it impossible to transport and feed hounds. The Old Chatham Hunt became a victim of the war and the OCH was disbanded in 1940. The hounds were turned over to the noted artist, John Carroll of East Chatham, who hunted them through the New Britain section of Chatham as a private pack. The Carroll hounds continued until 1953 when a disastrous fire at the Carroll home forced him to give up foxhunting. Enthusiasts met to determine how to keep the sport alive. It was decided to form a corporation for the purpose of foxhunting on horseback, hare hunting on foot and various other sports and social activities. In accordance with the by-laws of the new corporation, the club became governed by a Board of Directors. The kennels and other facilities were located at the home of Mr. and Mrs. W. Gordon Cox, Antinore Farm in Old Chatham. The original pack of hounds was getting old. Wanting to provide more varied sport, Captain Smith suggested acquiring a pack that could be hunted both on horseback and on foot. Consequently, a pack of harriers was drafted from Philip Crowe of Maryland, who had been appointed U.S. Ambassador to Ceylon. The harriers did not prove successful. They were too fast to be hunted on foot, and too difficult to control from horseback (they pursued rabbits rather than foxes). They also failed to meet the standards of the MFHA for the Old Chatham Hunt to become a recognized pack. In 1954, four couple of foxhounds were drafted from the Radnor Hunt and three couple drafted from the Genesee Valley Hunt. That enabled The Old Chatham unt to become recognized by the MFHA. In 1956, recognition was obtained from the National Steeplechase and Hunt Association as well. The hunt was based at Antinore Farm for the next twenty-five years. In 1980, the Hunt purchased a 21-acre tract in the town of Old Chatham. Here, the kennels were erected for the foxhound pack. Then in 1990, the Club raised funds to erect a beagle kennel, stable and paddock, plus living quarters for a professional huntsman. Through the years, Reynard has proven to be a wily adversary for hounds, hunt staff and large fields of riders. He usually succeeds in eluding his pursuers. During one recent autumn, he even dashed through Old Chatham Square. Those who saw the cunning old fellow swore he had a smile on his face as the speaking hounds and dashing horseman were coursing behind him.